Dyersburg, TN – Rough Country increases ground clearance and allows for up to 315/70 tires with its’ new bolt-on 6” raised knuckle suspension system for 02-05 2wd Dodge 1500 pickups. The new Dodge suspension is designed around raised driver and passenger side one-piece quality cast CNC machined knuckles, which maintain factory front-end alignment and optimal steering geometry. Fully welded front and rear cross members constructed from ¼” laser cut steel keep the suspension rigid and aligned, as well as provide improved strength and stability off-road. New longer anti sway-bar links, with factory type ends, eliminate preload and bind. The remainder of this complete lift system consists of front coil springs, front and rear bump stops, front sway bar relocation brackets, a 3” block and u-bolt kit for the rear, and Rough Country Hydro 8000 series shocks. The system’s shock absorbers can be upgraded to the Rough Country Nitro 9000 series. The new suspension also includes Rough Country’s limited lifetime warranty. Rough Country has designed this system for a quick and easy installation and developed to be professionally installed within 6-8 hours. It is a 100% bolt-on application, requiring no cutting, no welding, no drilling, and no exhaust modifications to install. This system requires aftermarket wheels with a minimum of 4.5” backspacing. 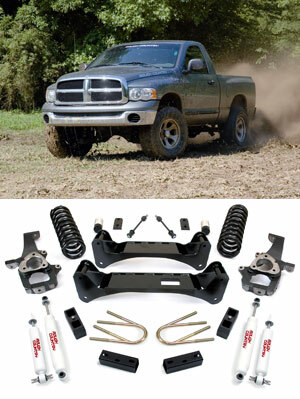 For more information on the new 02-05 2wd Dodge 1500 suspension, please contact Rough Country Suspension Products at www.roughcountry.com or call 800-222-7023. You may also contact an authorized Rough Country dealer. To find an authorized Rough Country dealer near you, please visit the “Dealer Locator” link at www.roughcountry.com.